We received the Fujifilm X-T1 IR for testing this week. I did a quick test shoot of the back of my hand to show what it can do compared to a normal camera. The Fujifilm X-T1 IR captures both infrared, visible and ultraviolet light (380-1000nm). Without any filter on the lens, the image becomes saturated with too much information (top right). The colors are off due to the infrared light. To make use of the camera for medical reflected infrared photography we need a filter that only let the infrared light through. Infrared light penetrates deeper into the skin than visible light, and is useful in medical photography to visualize subsurface structures. The bottom photos above are the same image straight out of camera (SOOC) and after conversion to B/W. A Kodak Wratten No. 87C filter was used. This filter appears opaque to the human eye, but as the camera sensor captures infrared light, a purple image was visible in the viewfinder/LCD and the photo could be composed with the filter on. The autofocus also worked fine with the filter on, so there is no need for focus shifting. Blood vessels absorb more infrared light than the surrounding tissue and appear dark in the bottom photos above. 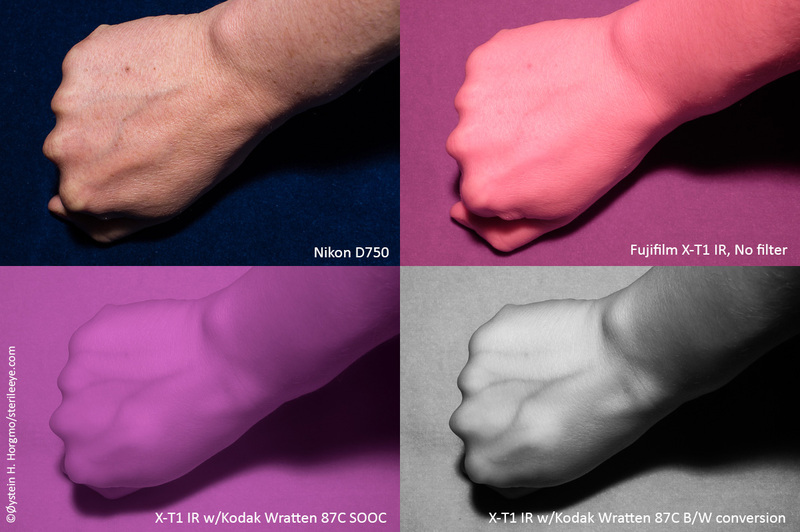 The photos were taken with low ISO and small aperture, and the sensor seems impressively sensitive to IR light. Fujifilm X-T1 IR camera with Fujinon 35mm f/1.4 lens. You are currently reading Fujifilm X-T1 IR Quick Test at The Sterile Eye.